The saying "lighting is everything when it comes to photography" cannot be overstated. This is such an important point we feel it needs further elaboration. There are two methods to light any scene. Let's talk about each and how we use lighting at All Commercial Photography. Flash comes in many varieties. From simple pop-up flashes , external flashes on top of a camera, compact portable monolights and power pack strobes which require a separate power supply. All of these flashes work basically the same way. You press the camera shutter and the flash pops. Pop-up flashes have their purpose but these should never be used professionally. External flashes are commonly used for event photography. They are placed on the camera's hot shoe or secured on a bracket above the camera. They also can be placed on stands and with lighting modifiers can be effective in shooting on location portraiture. Power pack strobes are typically used in the studio. While very powerful their weight and size makes them cumbersome to bring on location. easily packed and stowed. To paraphrase American Express, "We never leave home without our studio lights." In addition, we have external battery packs which allow us to fire the studio lights without the requirement of electricity. With studio lights we can go into any large room with multiple windows and feel confident we can light the whole room and keep the windows perfectly exposed. 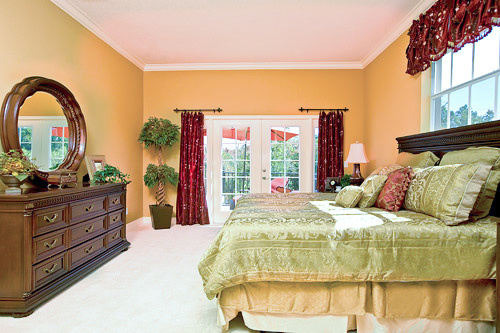 When shooting an interior with multiple rooms we can place studio lights in each room. This allows all the rooms to be properly exposed. No dark spooky rooms! When a camera does not use a flash to assist with lighting it is considered ambient lighting. Shooting with "available light" is another term frequently used. An interior can be lit with artificial light sources such as fluorescent, tungsten, halogen and it is still considered ambient lighting as long as a flash is not used. Photographing with just ambient light can lead to beautiful results. There is something very special and pleasing in capturing a scene in its purest form. The idea is to "capture the ambience". The answer is both. During the course of an assignment we may shoot all flash, all ambient or a combination of both. A lot of this depends on the requirements of the assignment, the elements in the scene and a variety of other factors. The answer of course is neither. The idea is to be prepared to handle a variety of circumstances which will allow us to adapt to get the job done and meet our client's requirements. This is a scene in which we used a studio light to mildly fill the room. This allowed us to capture the detail in the dark dresser and keep the windows from becoming over-exposed. The flash was subtle enough not to take away from the natural sunlight which created a beautiful pattern on the comforter. A gold reflector was used to enhance the scene. We hope this brief overview assists you in understanding one of the most fundamental and important aspects of good photography: LIGHTING.